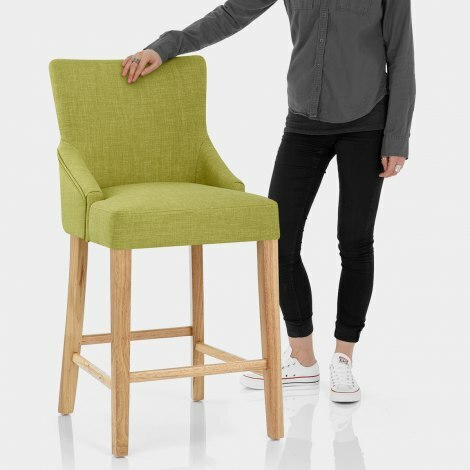 Add a subtle touch of colour to your bar area with the Magna Oak and Green Fabric Bar Stool. 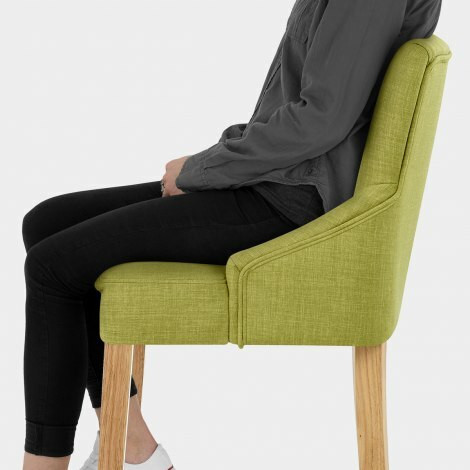 Refreshingly modern in design and super comfortable, the Magna also brings a touch of tradition to the home with its classic fixed height frame and chair-like seat. Utilising a fashionable olive green fabric, the padded seat and backrest reflect that of a sumptuous, encompassing armchair and are sprung for maximum comfort. Fixed to standard kitchen height, the solid wooden frame boasts four, sturdy oak finished legs that provide a hint of natural beauty. Bracing bars connect each of these legs, increasing the frames strength, and simultaneously providing a stabilising footrest to the Magna's fabulous design. "Colour is great and so is quality"
Really pleased with these barstools. Colour is great and so is quality. Love my new bars stools they look fab with my new white gloss Kitchen. Everyone comments on how nice they are and how comfortable they are, it’s a real nice shade of green and I built these myself so not difficult at all. Would deffo recommend them. I have seen others out there that are much more expensive! Super impressed by the quality of these chairs, easy to assemble and really comfortable. Well worth the money. Have to also mention the great 48hr delivery, first class service. Will definitely recommend to others and would not hesitate to use this company again. Thanks. Knew these were the ones as soon as I saw them! Love the colour which matches other pieces in my kitchen. Really comfy and a good price too. Delivery was flawless will definitely use again.